It’s been a while since the poker world saw the introduction of some new poker variants at the online poker tables, with the last notable addition to the games offered being Badugi and before that the addition of Mixed Games and Razz. But last week Full Tilt Poker added two new games –as well as a new tournament structure– to their lineup (well, one new game and one really old game) and this week it was PokerStars’ turn to give their players a few more options to choose from, adding two offshoots of PLO. Irish Poker is a Texas Holdem variant that plays a lot like the old Ultimate Bet game Crazy Pineapple. In Irish Poker each player is dealt four hole cards but must discard two of them after the flop. The game plays very much like PLO except that instead of choosing the two cards in your hand at the River, in Irish Poker you must make this decision on the flop and are forced to stick with it. 5-Card-Stud is definitely not a new game; it’s just been a “dead” game for a couple decades that FTP is apparently trying to resuscitate. A high-skill format, 5-Card-Stud begins with each player receiving one down-card and one up-card, followed by a round of betting. From there players are dealt a single up-card accompanied by another betting round until they have one down-card and four up-cards. 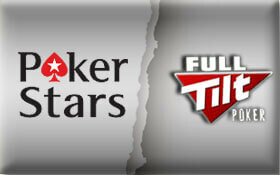 The final addition to Full Tilt Poker was a new tournament format called “Elevator” tournaments. In Elevator tournaments the length of the level increases the deeper you get in the tournament, helping to keep play deep-stacked for a bit longer than usual. The tournament starts out as a turbo, but with progressively longer level times players will not become short-stacked quite as fast, theoretically increasing the skill factor of the tournament. Big O, otherwise known as Five-Card Omaha is basically just PLO played with one major modification; each player is dealt five cards instead of four at the start of each hand. The same rules apply to the game as regular PLO, including the two-in-your-hand-three-from-the-board rule. Courchevel is yet another offshoot of PLO, and takes Big O a step farther. In addition to being dealt five hole cards at the start of the hand, in Courchevel the dealer will also burn and turn the first of the three flop cards. In a typical PLO game the cards dealt pre-flop account for 44.4% of the cards a player will see throughout the hand; in Courchevel this percentage jumps to a whopping 60%, making pre-flop decisions extremely important in this version of the game.